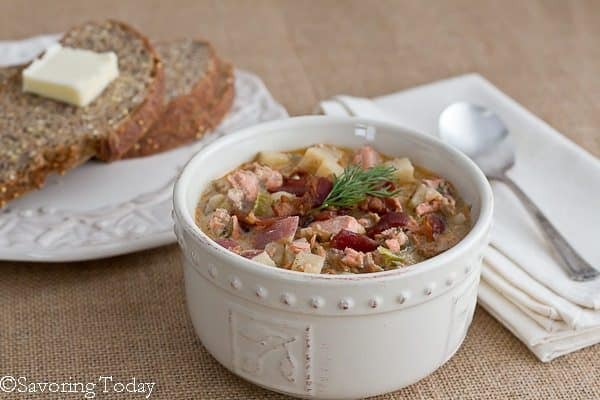 Salmon Dill Chowder is ideal for this seasonal bridge between winter and summer we call spring. Creamy broth, luscious wild salmon, and hearty potatoes deliver without the usual long-simmering aspect of soup. Not intended to feed an army or freeze for later, this chowder recipe for a quick fix of comfort when spring temperatures dip back toward winter. Spring weather in Colorado swings wildly from one day to the next, so a forecast of snow is no surprise to those on the Front Range through May. Blustering wind and grey clouds cannot dampen our enthusiasm for the green mist of budding trees filling the skyline. Tender feet hidden away in bulky socks and slippers are eager to slip into sandals once more and soak in sunbeams. Until then, we fill our menu with grilling favorites and comfort food like Salmon Dill Chowder for whatever way the wind blows. Creamy broth, luscious wild salmon, and hearty potatoes deliver on comfort without the usual long-simmering aspect of soup. Fresh dill and smoky bacon bring a fresh, yet hearty aspect to this quick and tasty soup. Heat a soup pot over medium heat. Brush skin-side of the salmon with melted butter and place skin-side down in the pot. Brush the salmon flesh with butter and sprinkle with blackened seasoning. (Reserve remaining butter.) Cook on each side for 3-4 minutes, then transfer to a platter and set aside. While the fish is cooking, prep bacon and vegetables. In the same pot, cook the bacon over medium heat, stirring frequently, until browned and crisp (about 5 minutes); transfer to paper towels to drain. Continue to prep remaining vegetables while bacon cooks. Stir-in stock (more can be added so the vegetables are covered in stock) and salt; bring to a boil. Reduce heat and simmer, covered, until potatoes are almost tender, about 10 minutes. Add milk, bring the soup back to a simmer, cover and cook until potatoes are tender, about 8 minutes. Break up salmon into bite-size pieces and add to the soup with any accumulated juices from the plate. Add half the bacon, dill, pepper, remaining melted butter, and simmer gently 3-4 minutes to meld flavors. Adjust dill, salt, and pepper, to taste. Ladle into warmed bowls, garnish with remaining bacon, and serve. Soup can be thickened by pureeing 1-2 cups of the soup in a blender then added back in, if desired. Sweet potatoes can be substituted for half the red potatoes. To thin the soup, add equal amounts of chicken stock and milk. I can’t find a single comment that says this recipe TASTES good or bad. Just a bunch of “looks great” comments. Not useful in any way. Hi there! I sometimes wonder the same thing when looking for recipes, but often just have to trust the blog if I’m already familiar with it. Of course, then there’s the risk of trying any new recipe. If there is something in particular you’re looking for in a Salmon chowder, like creaminess, light texture, clean flavor, just ask and I’ll be honest. Hope that helps. And I do hope you try it and will take the time to comment and let me know what you think. I was headed to your Hearth and Soul post and somehow I clicked on this by mistake. But I’m so happy I did. This chowder is AMAZING. I want to make this today. Thanks April, it is a comforting soup. Sounds like the weather there has been like ours here in CO — high of 60° today, snow tomorrow — it’s crazy hard to always know what to plan to fix for dinner. WOWOWOW. Seriously, this salmon dill chowder looks absolutely incredible. I love chowders and salmon and dill are amazing together! Thanks Joanne! And thanks for taking the time to comment, I do hope you try the chowder. This sounds and looks delcious, I love salmon and dill but would never have thought to use them in a soup. yum! What a delicious looking soup this is! 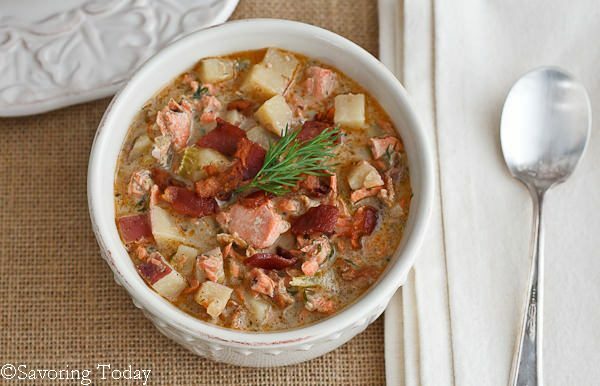 I’ve never had salmon in a soup before, but I think this chowder would be wonderful. Yum! Your chowder looks sooooo good! I love a good chowder, and I happen to have bought some salmon yesterday! Yippee, I’m going to make this! Thanks for sharing this with Sunday Night Soup Night, look forward to seeing you again soon! 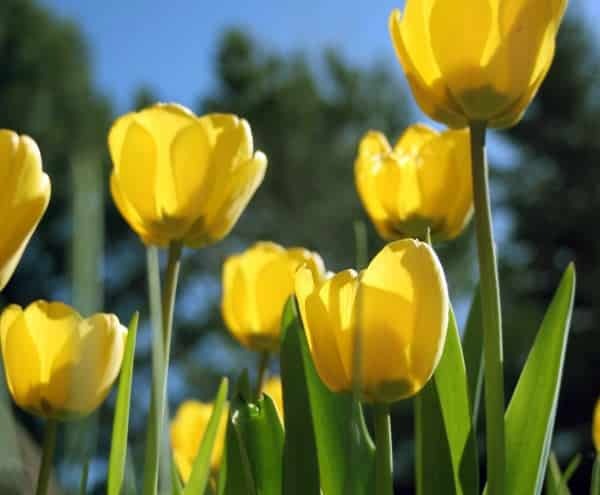 The tulip photo is SO very Spring and SO beautiful! I’m loving this warmer than normal weather and it can get even warmer for me. Your chowder looks delicious with tons of flavor! Hope you have a wonderful Easter weekend! This looks wonderful. I wish it was soup weather here. We skipped spring and catapaulted into summer. Wow, the color of that chowder is gorgeous, Judy! Did someone say….bacon?? haha yes please! Salmon, bacon and tomatoes.. perfect soup combination!! Thank you, Mary, it was nice to have a break and good to be back. I love salmon and dill – this looks good! Are you loving the snow this morning? 🙂 Glad you had some time to relax! Actually, we are loving the snow since we’ve not seen much this winter and conditions are quite dry. So grateful it waited until after spring break though!